A crate can be an extremely helpful tool for house training and to help new dogs keep out of trouble when you aren’t around, but there are some possible downsides to using crates that can make them unsuitable for some dogs. If your dog has separation anxiety, was over-crated by a previous owner, or the crate was used for punishment in the past, crate training might not be an option for you. Or maybe you need to leave your dog for too long, or you simply don’t like the idea of crating him. Confining Safely Without a Dog Crate – What Are the Alternatives? Depending on your particular circumstances, there are some other ways you can keep your puppy or dog contained and safe while you aren’t home. Let’s take a look at some of your options. 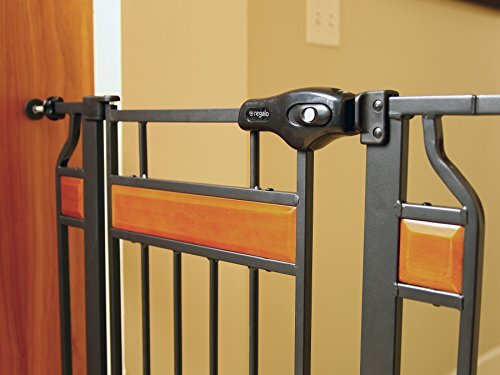 Confining your puppy in a safe, easy-to-clean room (generally a kitchen, hallway, laundry room or bathroom) using baby gates has a number of advantages over just letting your dog roam the house or shutting him into a bedroom. Rooms without carpeting are easy to clean up in the event of mistakes and prevent your puppy from having something to rip up that really matters to you. These rooms are easier to puppy-proof and usually provide fewer opportunities for trouble. Exercise pens, or x-pens as they are sometimes called, are a sort of doggie playpen. They create a safe indoor space for your puppy that is larger than a crate, and more open. Available in many sizes, you can create a little area for your puppy within a room, without allowing access to your cabinets and baseboards. As with baby gates, you should pick an uncarpeted area. Also consider the size and strength of your puppy, since x-pens can be knocked over or jumped over. Some people use x-pens to create three sides of a confined area, and attach them to a wall on the fourth side. This helps stabilize the pen and keeps your puppy from moving it around the room. 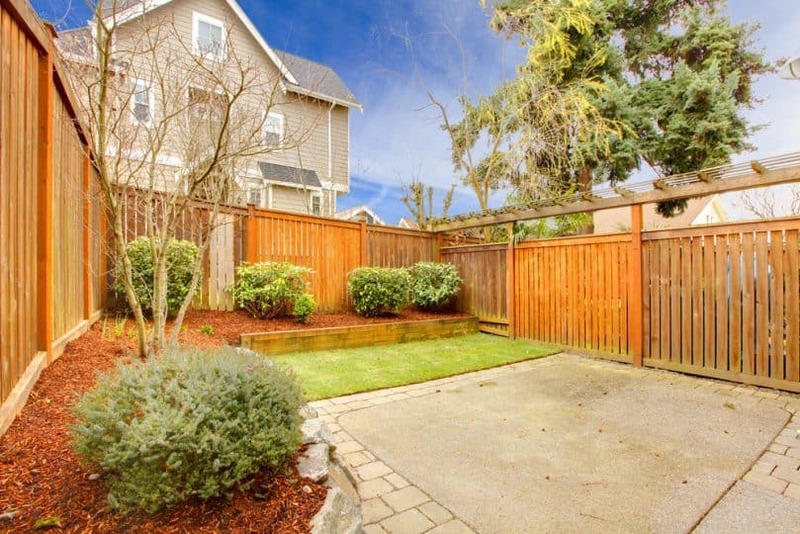 If you have a secure privacy fence, it may be possible to keep your dog outside when no one is home. If you choose this option, be sure your dog doesn’t bark all day and make your neighbors crazy. And this is not an option for a dog who loves to dig. Since your dog’s comfort and safety are vital, you must ensure that he has shelter from cold, rain and sun, and has water available at all times. Check the fence weekly to make sure there are no spots where he can dig out when you aren’t looking. For those who can afford it, doggie daycare is an excellent alternative to leaving your pup alone all day. He comes home tired and happy, which eliminates many behavior problems you might see if he’s been bored and restless all day. Daycare facilities have rules about the age and temperament of dogs they will take, and it may not be a viable option even if you have the budget. Check with the facilities in your area to see what the requirements are before deciding on this option. Be sure to provide safe toys in your dog’s space. Interactive food toys like Kongs or Buster Cubes can keep your pup busy for hours. Break up the day with a walk. Find a family member, neighbor or dog walker to take your pup out for a potty break, some exercise, and a bit of people time. Be sure to puppy proof your dog’ space. The better you keep things out of reach, the easier it is for him to stay out of trouble. Use an area that’s easy to clean, with a non-absorbent floor. Keep in mind that dogs are social creatures and get bored with nothing much to do all day. Food – put all food away. Some human food is dangerous for dogs, either toxic or a choking hazard. Cabinets and knobs – Use childproof locks on cabinets that contain food or household chemicals. Keep in mind that dogs have been known to turn on stove burners, so if you have knobs they can reach, childproof them as well. Pick up – Don’t leave anything in your dog’s area that you wouldn’t want him to chew. Shoes, kids’ toys, remotes, cell phones and anything else that is not a dog toy doesn’t belong in his area. Medications – Be sure medications and toothpaste are in a cabinet that your dog can’t reach or open. If you ever keep meds in your purse, be sure there is no way he can rummage around in it. Also, chewing gum often contains xylitol, which is toxic to dogs. Cords – Be sure you hang curtain/blind cords up high where your dog can’t reach. Many dogs have become tangled in these and strangled. Avoid tragedies by checking the area thoroughly for hazards. Plastic bags are dangerous, as is a choke collar when left on while a dog is unattended. Trash – Be sure your dog can’t get into the trash while you’re gone. If it isn’t locked in a cabinet or closet, be sure it has a lid. You may need a lid that latches onto the can if your dog is especially good at opening it. Plants – Many houseplants are poisonous to dogs if eaten. Be sure you clear any plants out of his area. 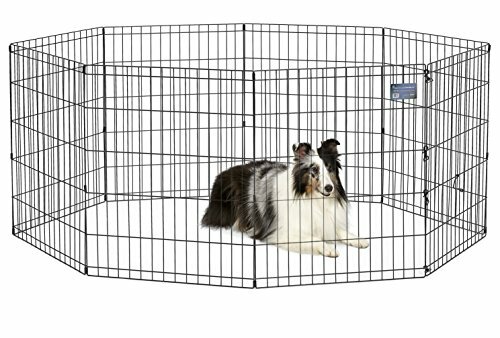 If you have a puppy or dog that needs to be confined but you don’t want to use a crate, there are several alternatives available to you. But no matter how you confine your dog, remember that he needs exercise and company to be a happy and well-adjusted pet.